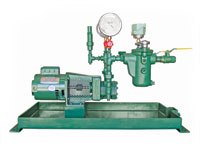 The Albany FO Series Simplex and Duplex Pump Sets are designed for emergency diesel generator facilities as well as dual fuel fired boiler facilities. Its innovative compact design has a minimal footprint while delivering 1 to 150 GPM of fuel to serve emergency generators and boilers. The mechanical design integrates the Albany ‘G’ and ‘H’ Series positive displacement Helical Gear pumps, and the Albany ‘BS’ Series Basket Strainer. The assembly is complete with check valves, ball valves, pressure / vacuum gauges, relief valves. The unit is mounted on an integral containment with leak detection monitoring.